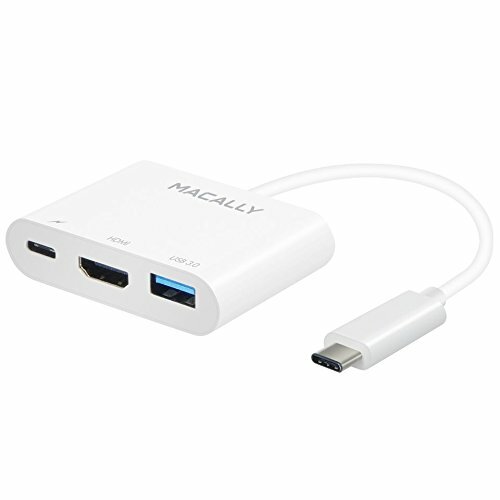 The Macally UCHDMI4K is a convenient 3 in 1 multiport adapter that allows you to connect your TV, monitor or projector with HDMI as well as your existing USB devices to your MacBook, while keeping it fully charged, through the USB-C port! connect your HDTV, monitor and projector with HDMI to your MacBook for the best video quality! the Macally UCHDMI4K supports a video resolution up to 1080P. You can also connect your existing USB devices, like your keyboard, mouse, HDD, flash drive, printer, scanner, iPhone, iPad, to the standard USB 3.0 port so you can continue to use them with your MacBook. And finally, while you have all devices connected, you can still charge your MacBook by connecting a USB-C AC adapter (not included) to the USB-C port of the adapter. Allows you to continue to charge your device at full speed while using additional USB devices.